A Category 5 hurricane rips across the Atlantic Ocean. The storm makes landfall on Puerto Rico, where it wipes out all standing infrastructure in its path. Blocked roads and bridges prevent food, water, and medicine from reaching thousands of people in need. In Mr. Shawn Cusson’s Critical Making I course, students answer this question head-on. Except, instead of food, resources, and lives at stake, they shrink the problem into the size of a 30 square- foot classroom. There, they must find a way to transport resources in the form of marbles from a makeshift factory to imaginative villages with only a few pieces of paper at their disposal. Every day, the narrative changes. On Tuesday, the trucks used to carry the marbles stop working. Or, on Friday, another road closes. On their toes, the 7th grade students find a way to pivot and adapt. 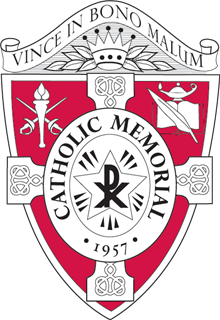 Now in its second year, Catholic Memorial School’s Critical Making I course gives the middle school students a tool far more valuable than any laser-cutter or 3D printer. It gives them the savvy creativity needed to develop into flexible thinkers. Such thinkers break the mold of yesterday’s play-and-plug workforce. These thinkers mature into tomorrow’s doctors, businessmen, engineers—the leaders our world needs to achieve a brighter future. And it all starts with a few marbles and some construction paper, all made possible by CM’s partnership with EXPLO Studios. Known as “For All the Marbles,” the exercise begins and ends with the CMEXPLO collaboration. EXPLO, a nonprofit education innovator, designs curriculum made to invite students out of their comfort zone and into an active classroom. In 2017, the non-profit began a collaboration with CM that provides curriculum for the school’s seventh grade Critical Making I course. EXPLO designed “For All the Marbles” not for independent practice. Rather, they created the activity for engaging, active learning through collaboration and discussion. Beginning with a free-standing cardboard tower on a pedestal in the middle of the room, the exercise leads off with its hurricane narrative. “We take the real-life idea of Hurricane Maria coming through and destroying a good portion of Puerto Rico,” said Mr. Cusson, who co-teaches the course alongside EXPLO Curriculum Developer Mr. Jon Griffiths. 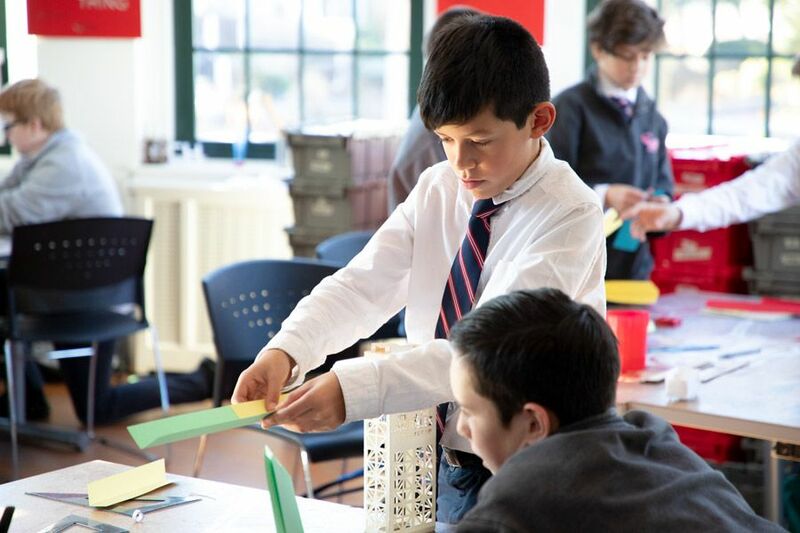 The 13-year-old students then design construction paper and free-standing structures to deliver three of the tower’s marbles into a distant pickup truck. Of course, the students miss the truck on the first few tries. A few students, unsure of how to set up their miniature conveyer systems, look lost. They try a few different methods on their own before a few students raised their hands. Mr. Cusson provides a lesson for every marble that lands just outside the truck’s reach. Without telling them the answer to the problem, he suggests that his students experiment by altering the materials at hand. A few students fold their construction paper in half. Others cut theirs into different shapes. Some try to improvise and connect numerous sheets together. Each time around, the marble inches closer and closer to the pickup truck. “Having this tangible idea to work with and the detail in the structure that they’re working with adds to their buy-in of wanting to complete the challenge,” said Mr. Cusson. Set up as a pass-or-fail course, Critical Making I dares middle school students to take a leap of faith, learn from failure, and to channel their imagination without the fear of a bad grade. Rik Orup, a resident of Sudbury, learned the importance of collaboration in his first few tries. “At first, we tried to do flat paper without the triangles and it was a little unstable and it kept falling,” said Rik. The two 7th graders worked together as a part of a four-boy group, observing every variable along the way. They even noticed that whenever a single marble landed in the truck, the truck inched forward. This meant that they needed to find a way to stop the truck so that the other two marbles made their way into the truck too. Together, they devised a plan to stop any forward progress with pieces of cardboard. One-by-one, the marbles began to fall into place. Mr. Cusson encouraged groups around the classroom to observe numerous designs before settling on their own. Inspired by Connor and Rik, those who passed by observed and took note. By the end of the afternoon, nobody managed to lose their marbles. In 2018, the middle school’s Critical Making program took an important step forward. This fall, it added a Critical Making II course for the eighth graders to build upon what they learned from the year prior. “At the beginning of the year last year, our conversations were honestly quite silent. It would be like pulling teeth, asking kids to say things,” said Mr. Griffiths in hindsight. Critical Making II gives Mr. Cusson and Mr. Griffiths four sections of 8th graders. To accommodate the 8th grade course, Critical Making I refined its focus. While Critical Making I lists observation, tool usage, and material choices as its learning objectives, Critical Making II forces students to question what they observe and why they choose specific tools and materials. The middle school curriculum requires all CM students to take both courses before matriculating to the high school. That way, each student arrives ready to embrace its Knight Based Learning (KBL) philosophy. Beginning in 2017, CM launched KBL as its own redefined version of project-based learning. Operating within the framework of the school’s Brother Edmund Rice tradition, KBL connects faith and service with real-life problems across different subjects. Classrooms require new open and collaborative work spaces to best execute this active learning mission. To put it simply: gone are the days of memorizing geometric proofs and reciting lists of former of presidents. “Parents or teachers might ask us about studying the laws of physics. We are covering Newton’s second law, but at this point we are not worried about remembering exactly how it’s worded,’” said Mr. Griffiths. In the summer of 2019, CM will break ground on its cutting-edge Center for Integrated and Applied Learning (CIAL). The center, set to replace the administrative wing as the focal point of the Baker Street campus, will offer 21st century studio classrooms and modern workspaces. In early December, Mr. Cusson brought back “For All the Marbles” for one more go-around. This time, he wanted to see how his class responded in the face of adversity. The truck, now pushed a few feet back, still needed all three marbles from the tops of each group’s tower. However, the imaginative hurricane destroyed even more of their supplies. With only half the construction paper from their last assignment at their disposal, the students found themselves in the unknown. Instead of a room full of blank stares, a culmination of two months’ worth of collaboration and problem-solving welcomed Mr. Cusson. The 7th grade students exchanged ideas, experimented with different materials, and picked out their most efficient designs. They worked together, not by themselves. Sure, a few marbles landed just shy of their trucks. But nobody pouted. Nobody felt discouraged. Instead, they learned from their mistakes. Each time a marble landed on the floor, they took note and moved forward. They worked with what they had in front of them. When each student left Mr. Cusson’s room that afternoon, they left with a sense of wonder. Questions littered the hallways. If each student leaves the middle school with anything, it must be those two words. Those two words power the 3D printer. They give life to the high school’s Innovation Lab, Math Studio, and the future CIAL. Without all the “What if’s” and “I wonder’s,” thinking stays rigid. Learning turns dull. At CM, students learn how to open the doors to education in the 21st century. They welcome in their classmates to join them and collaborate. Together, they welcome the future of learning.